Charles L. Levin was born on April 28, 1926 in Detroit, Michigan. The Levin family is well known in Michigan politics. Levin’s cousins, Sander Levin and Carl Levin, both represented Michigan in the United States Congress. 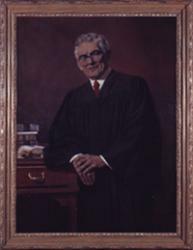 His father Theodore Levin was Chief Judge of the U.S. District Court of the Eastern District of Michigan. Charles Levin received his B.A. from the University of Michigan in 1946. He also received an LL.B. degree from the University of Michigan Law School in 1947. He was admitted to the Michigan Bar in November of 1947. Levin joined the New York Bar in June 1949, the District of Columbia Bar in October of 1954, and the Bar of the Supreme Court of the United States in 1953. Levin is also a member of many different law organizations including the American Law Institute, the American Bar Association, the State Bar of Michigan, the Detroit Bar Association, the Association of the Bar of the City of New York, and the American Judicature Society.